You are here: Home / physical therapy / Aging Without Shoulder Injury and How Yoga may be a Great Option for You! Aging Without Shoulder Injury and How Yoga may be a Great Option for You! As we age, there are normal changes that our shoulder joints go through. They tend to lose strength, flexibility, and may start making popping and crackling noises. However, there are also changes to the shoulder that are not normal and could lead to injury and pain. In fact, it has been documented that the prevalence of shoulder injuries can range from 6.7% all the way to 66.7% with impingement being among the top shoulder diagnoses. Essentially, impingement is a narrowing or tightness in the shoulder that puts pressure on the tissues inside of your joint. Regardless of whether or not this is a new or old injury, most people can benefit from conservative treatment and overcome it. The Journal of Orthopedic & Sports Physical Therapy published an article titled, Scapular Muscle Activity During Static Yoga Postures (Chopp-Hurley, 2018) which discussed how doing yoga can help strengthen shoulder stability which would in turn help prevent shoulder impingement symptoms. 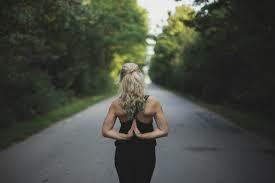 The nice thing about yoga is that there are hundreds of different poses or postures from which to choose. Depending on your level of activity or level of injury, you might choose one over the other. The article that was published split up the yoga poses into two categories. The first category is reserved for low level muscle contractions of the shoulder blade stabilizers (The beginner Level). People who might benefit from this would be those who are in a in an early rehab phase for rotator cuff injuries or shoulder impingement (people with more than a moderate amount of pain). The poses this article suggested are: Dancer’s Pose, Reverse Table Top, and Warrior II. The second category of poses would be reserved for those with minimal to no pain who are in a later phase of their rehab (Intermediate to Advanced). The poses the article suggested for this category are: Crow Pose, Side Angle, and Side Plank. One thing to keep in mind before looking these up on the internet and trying these different poses is that everything that you do when trying to rehab a shoulder should remain pain free. If you have pain, injury, or weakness, your best bet is to give us call at Physical Therapy Connections, so we can evaluate and assess your shoulder. We would hate for you to try an exercise you found online and get hurt even worse from it. I am also offering a complimentary workshop to discuss shoulder pain, aging changes, and can discuss these yoga poses more in depth. My next workshop is scheduled for Thursday, September 6th 2018. I hope to see you there!